How To Buy The Best Beard Trimmers And Hair Clippers - Which? The best beard trimmers and hair clippers keep you looking smart and save a trip to the barbers. Our top tips help you pick the best from the rest. Cutting your own hair or trimming your own beard can save you the time, money and perhaps even the disappointment of a trip to the barbers. After all, what better way to get your hair and beard looking exactly how you like than by doing it yourself, right? Well, yes and no. The best beard trimmers and hair clippers will do all this with ease, but the worst will leave you with scruffy hair or a patchy beard. Some will cut evenly, but are so imprecise that it's all too easy to take more off more than you were planning on one side, leaving you desperately struggling to even it up on the other side. Don't risk picking up a dud – read on for our expert advice on how to buy the best hair clippers and beard trimmers. We answer the most important questions so you know how much you need to spend, the type you need, what features and settings to look out for and how easy different models are to use, clean and maintain. If you already know what you're looking for take a look at our first look beard trimmer and hair clippers reviews, to discover what our researchers made of different models. The price of hair clippers varies hugely. A basic set might only set you back £10, but professional hair clippers can cost hundreds of pounds. Factors such as brand, type and special features can all effect the price, so read on to find out what you should be looking out for. Beard trimmers tend not to be as expensive as hair clippers – even at the high end of the market you should still get change from £100, and plenty of models cost much less. If you want both an electric shaver and a beard trimmer you might want to consider an all-in-one product, but expect to pay more. Most electric shavers come with a pop-up trimmer, but this is more for straightening up sideburns and cleaning up the hair between your upper lip and nose than for a full beard. If you think that's all you need then read our electric shaver reviews. 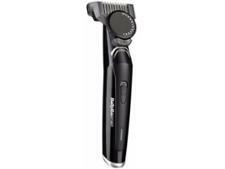 The main decision to make when choosing a beard trimmer or hair clippers is whether you want a cordless model. The advantage of cordless clippers and trimmers is that you can manoeuvre them easily and use them anywhere. But you’ll have to remember to recharge them afterwards, or risk only having enough battery to cut half your hair or beard next time around. You’ll never have this problem with corded models, but you might find that the cord can get in the way, and you’ll only be able to use them near a suitable socket. With beard trimmers, you also need to think about whether you want to trim a full beard or simply maintain stubble. If it's the latter, you might want to consider buying a stubble trimmer, such as the Babyliss i-Stubble 789OU. What settings and features should I look out for? The most important thing is to choose a trimmer or clippers that will be versatile enough to cut your hair to the length you want. Some models come with different attachments, while others have a built-in setting that changes the angle of the head to achieve different cutting lengths. The latter can be more expensive but the advantage is that you don't have to remember to pack several little bits when you go away, and they often let you adjust the length setting by mere millimetres for greater precision. 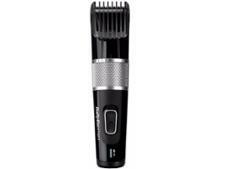 All our beard trimmer and hair clipper reviews list how many length settings the model comes with in the technical specifications section, so you can easily pick out the one that best suits your needs. Not a Which? member? Sign up for a £1 Which? trial to access these and thousands of our other reviews. 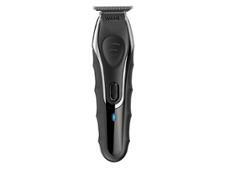 Some beard trimmers also come with features that could help you get a neater, more even finish. For example, the Philips BT9280 comes with a pop-up laser which is designed help you cut in a straight line. Read our full review to find out whether we thought it was useful or not. Are they easy to use, clean and maintain? Beard trimmers and hair clippers come in all shapes and sizes, some of which are easier to use than others. It's essential that it feels secure and comfortable in your hand as this will give you more accuracy and make trimming or clipping seem like less of a chore. Unlike most clippers, the Babyliss Easy Cut is shaped like a ice hockey puck – find out what our researcher made of it by reading our full review. If you want to get the most out of your trimmer or clipper for years to come, you'll need to lubricate the blades from time to time and make sure you clean the head after each use. Look out for products that come with lubricating oil and a cleaning brush in the box. Or, for even easier cleaning, choose a waterproof model that can be rinsed under the tap after each use.